23 years after its release, Mariah Carey’s “All I Want For Christmas Is You” is still breaking music records. According to Chart Data, the modern Christmas classic has taken the top spot for biggest single day of streaming by a female artist on Spotify with over 8 million plays. Mariah Carey's "All I Want For Christmas Is You" has broken the global Spotify record for biggest single day for a female artist (8,069,105 streams on Dec. 24). 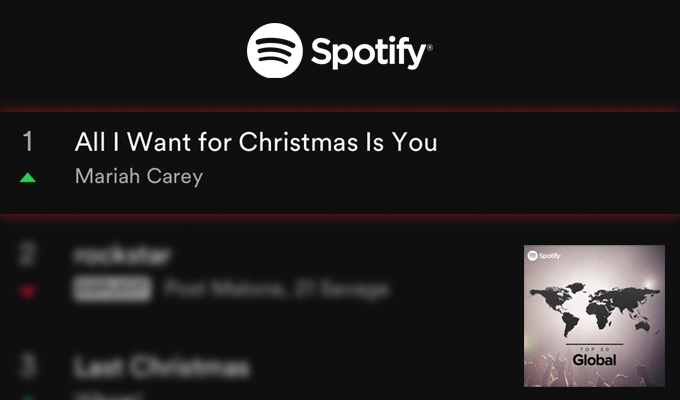 It turns out “All I Want For Christmas Is You” has also been streamed a total of over 300 million times on Spotify, making it the third song from the 1990s to reach that figure, and the first from a female artist.It turns out “All I Want For Christmas Is You” has also been streamed a total of over 300 million times on Spotify, making it the third song from the 1990s to reach that figure, and the first from a female artist.